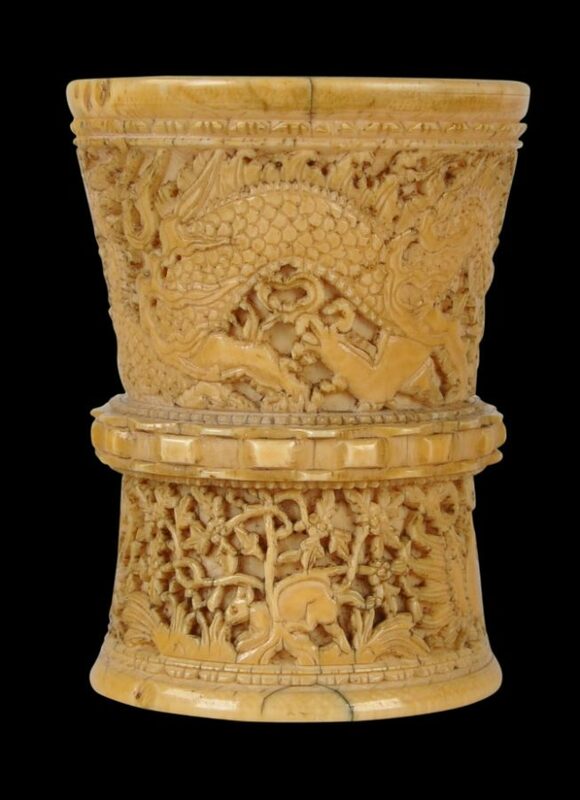 This rare ivory mortar dates to the 17th century and most likely was produced in what is now Vietnam, for the European market. One related example is believed to have come from a convent in Portugal where it was used to pound aromatic gums in the preparation of medicines (Clunas, 1984, p. 161). 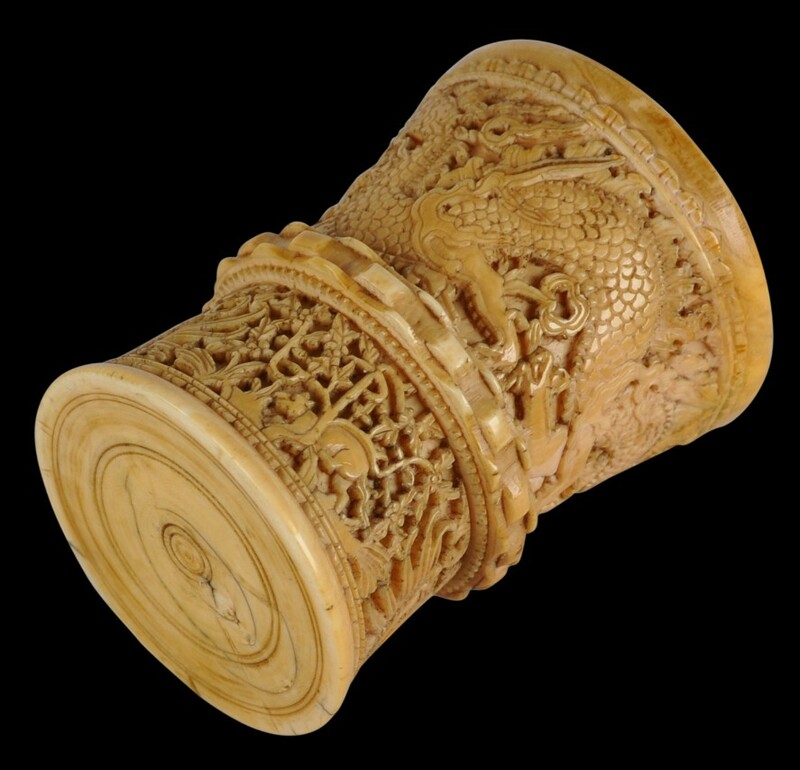 This mortar forms part of a rare, small group of items carved from ivory, all of which date to the same period, have near-identical carving and motifs, and which all, almost certainly have come from the same workshop. It was believed until recently that this group came from Canton, but now, attribution is more commonly ascribed to Tonkin in what is now northern Vietnam. Vietnam had greater links to Portugal from 1614 when the rulers of Japan expelled all foreign missionaries. Pope Paul V in his quest for new locations in Asia for missionary work sent Catholic preachers to Vietnam, then known as Cochinchina, and a Jesuit mission was established in the northern city of Hanoi in 1615. 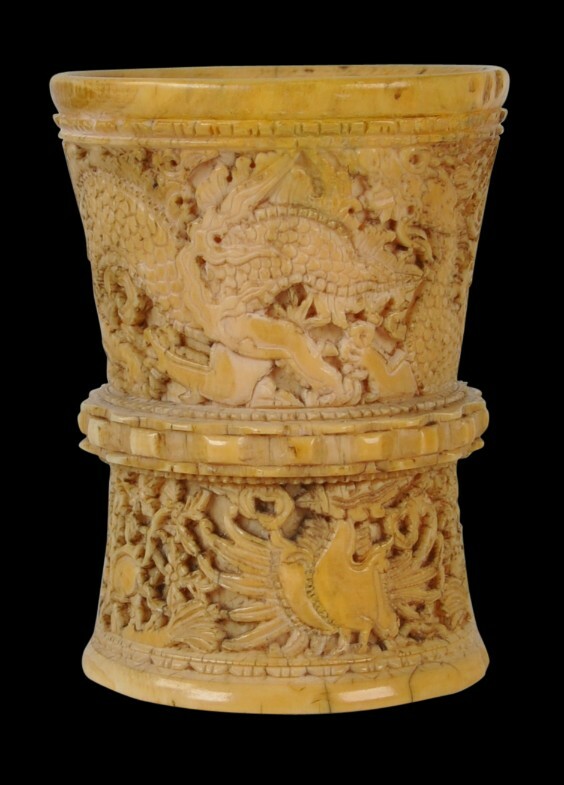 Of waisted, cylindrical form, the mortar is carved in high relief with two extravagant dragons in the upper panel, and two phoenxies in the lower panel, along with squirrels and shrubbery in bloom. 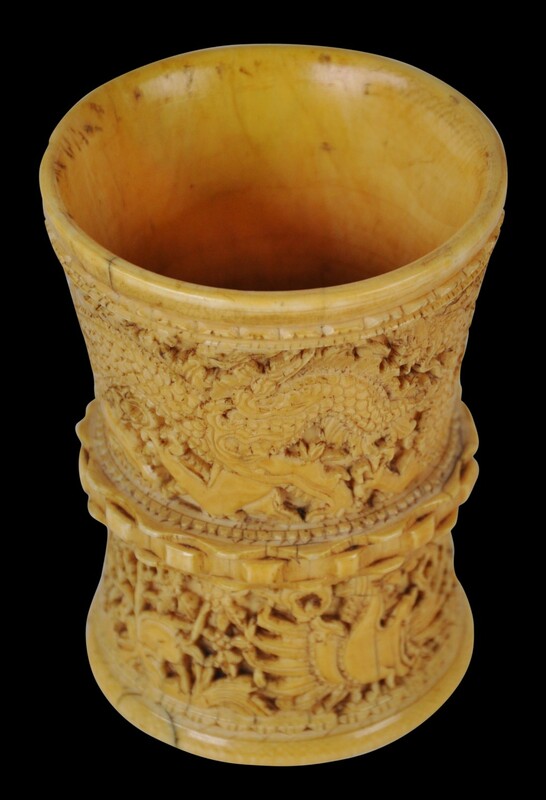 The central section has a carved, crenulated rib. The upper section is border of to the top by a thin border of petals. The carving on this mortar is particularly fine and dynamic. The phoenixes have their wings flared open, reminiscent of royal emblems, and the bodies of the dragons undulate around the beaker. 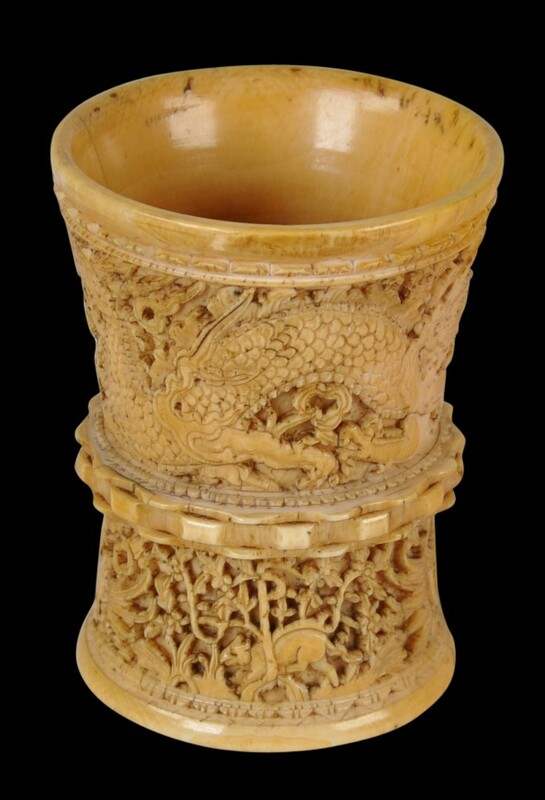 The mortar has been carved from a single piece of ivory. The phoenix is known as a plucong hoang in Vietnam and is considered a composite bird. 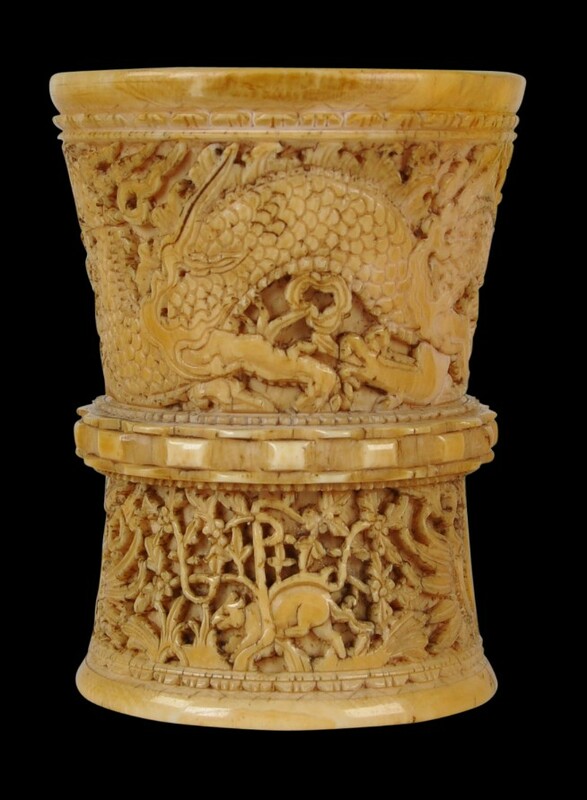 The dragons depicted here have four claws which were reserved for royalty and the nobility. 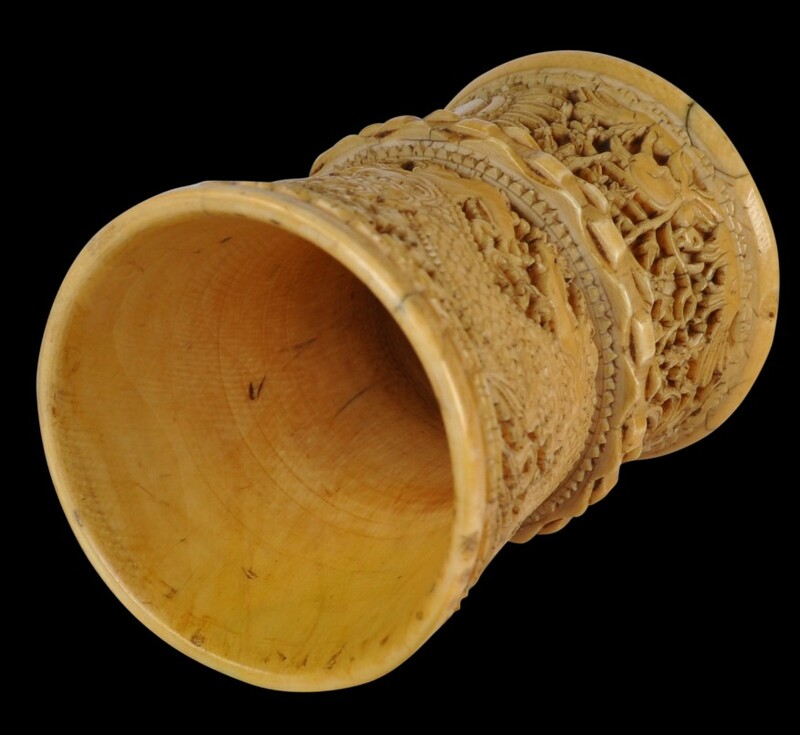 A similar mortar has been recorded in the Royal Danish Kunstkammer since 1674 and illustrated in Gundestrap (1991, p. 77). Three similar mortars are illustrated in Clunas (1984, p. 161) – one is the Royal Danish Kunstkammer example, one is from a private collection, and another is from the Sir Victor Sassoon Collection, now in the British Museum. 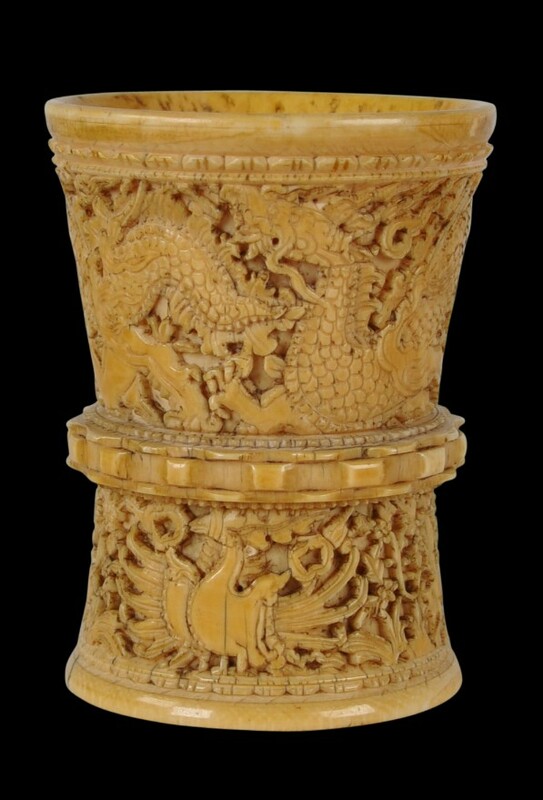 The British Museum also has another, which was found in Burma in the 19th century. The example here is in fine condition. It has a deep, honey-yellow patina consistent with centuries of age and handling. 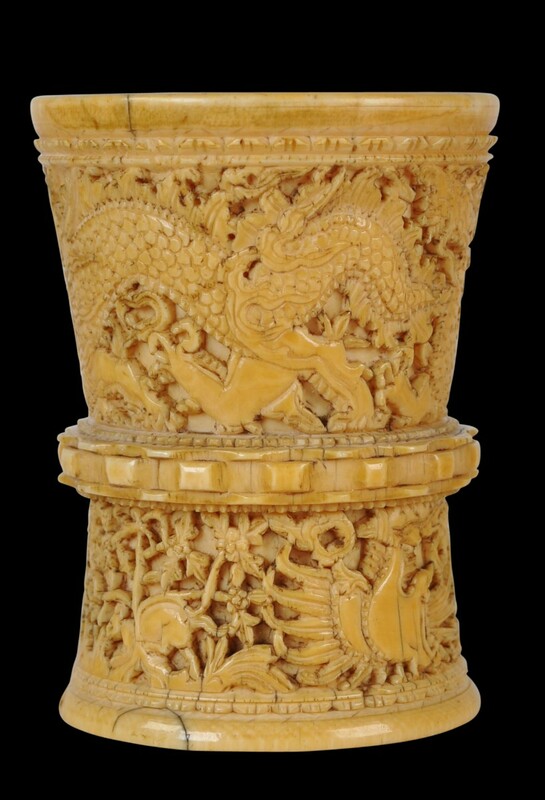 Clunas, C., et al, Chinese Ivories from the Shang to the Qing, Oriental Ceramic Society, 1984. Gundestrap, B., The Royal Danish Kunstkammer 1737, Volune II, Nationalmuseet, 1991. Veenendaal, J., Asian Art and the Dutch Taste, Waanders Uitgevers Zwolle, 2014.